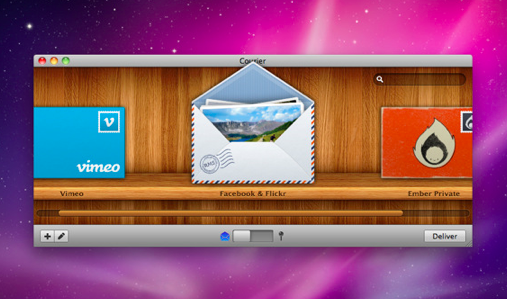 So now the Mac App Store has arrived, what apps should you download first? We’ve been scouting around and here’s our pick of ten apps to start with. We’ve opted for apps that are free or inexpensive. Although there are many significantly more pricey and substantial apps in the store, the ten we’ve listed here are a good place to start with the Mac App Store without shelling out a fortune. Download link – It’s not for everyone, but if you appreciate a good-looking, lean and lightweight Twitter client, this is it. 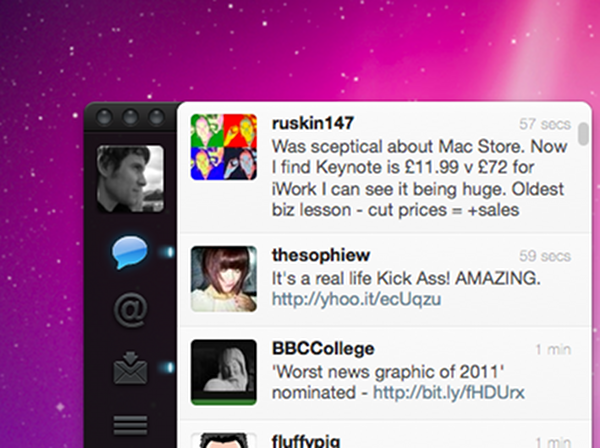 The first significant update to Atebits’ classic Tweetie for Mac app since the developer was acquired by Twitter last year, this version adds some neat graphical flourishes and real-time updates courtesy of Twitter’s User Streams API. You can read our full review of the new app here. Download link – It’s already conquered the mobile gaming world and this week these agitated avians have landed on more platforms including Windows and now the Mac. 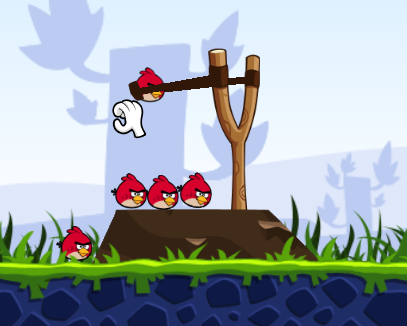 Just like on every other platform, the game sees you flinging a range of birds with their own special attack skills at evil green pigs across a range of increasingly complex levels. It’s been ported over from iOS nicely and it really doesn’t suffer from the move to mouse or touchpad control from the touchscreens it was originally designed for. It’s just as addictive, too. Okay, maybe you shouldn’t download this one if you value your productivity. 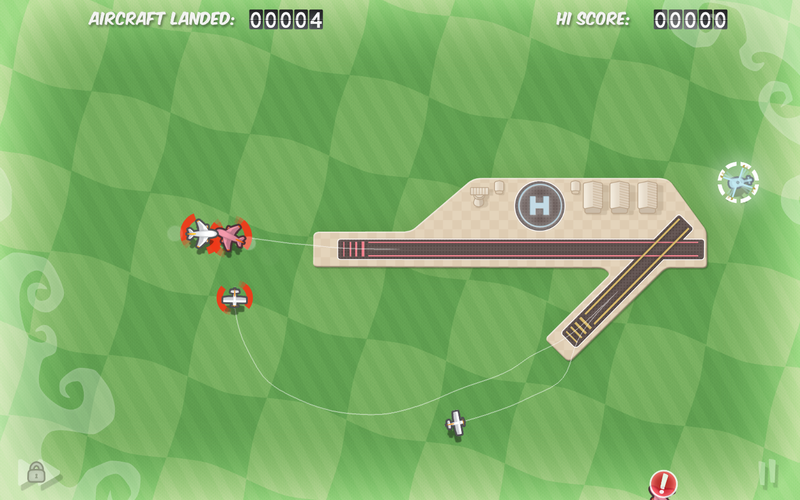 Download link – Another game that has made the transition from iOS to OSX well is Flight Control. The game sees you guiding planes and helicopters into land by drawing paths for them across the screen, with panic levels rising as the volume of aircraft on screen increases. The game works better with a mouse than on a Magic Trackpad in this case, with use of the shift key required to set up flightpaths in the latter case. While players who are used to finger-based control may take a few minutes to get used to the game on the desktop, it quickly becomes just as addictive an experience as its mobile sibling. 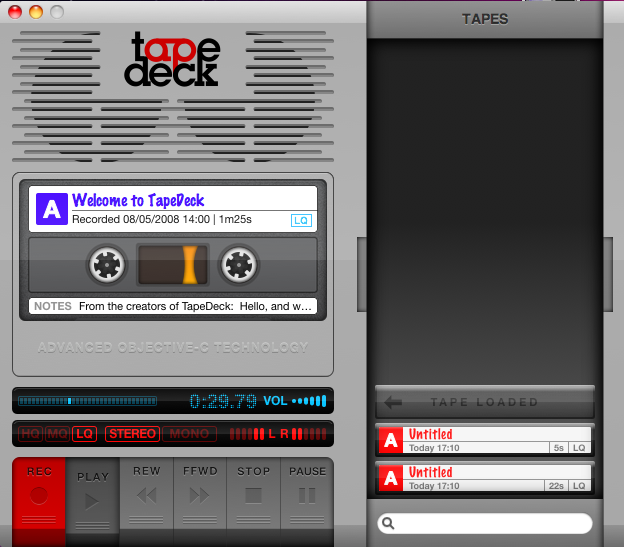 Download link – Tapedeck isn’t a new app but it’s the perfect example of one that could gain a new life in the Mac App Store as it’s suddenly easily discoverable to an audience that may not have heard of it before. Essentially an easy audio recorder, Tapedeck works exactly like an old-school portable cassette machine. Click ‘Record’, speak into your Mac’s mic and it can record for as long as you like. Whether it’s for noting down a quick reminder or recording an hour-long seminar, Tapedeck is incredibly to handy to have around. All recordings are stored in a ‘tape drawer’ that’s revealed when you double click the right-hand side of the app. Tapedeck does one thing perfectly and that makes it a perfect “App Store app”. Simple, accessible and to the point. Download link – This utility makes sending images from your desktop to a range of online services quick and easy. Like Tapedeck, it uses a real-world metaphor – in this case you can upload files to Flickr, Facebook, Vimeo, YouTube, MobileMe and putting them in an envelope, just like sending them by snail mail (but a lot quicker). Simply drag the ‘stamps’ of the services you want to send the files to onto the envelope and then drag and drop the files you want to send into it. You can edit metadata like titles and tags easily before sending your files away to their destinations. Courier is another perfect fit for the App Store, with a very “Mac-like” look and a streamlined, stylish interface. Download link – A little like Twitter for Mac but for Facebook, Clarity is a standalone app that lets you keep on top of your Facebook newsfeed and post status updates and photos. It’s also quick and easy to manage friend lists and sync them back to your Facebook account, so if you use that feature (or have always wanted to try), this is worth a look. 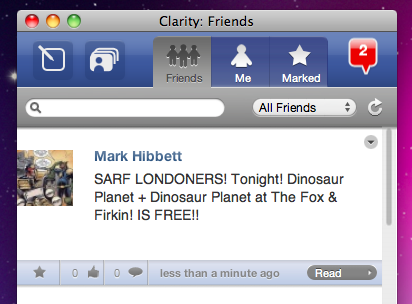 While it’s no substitute for the full Facebook experience, Clarity is a good app for Facebook addicts to keep running in the corner of their screens. 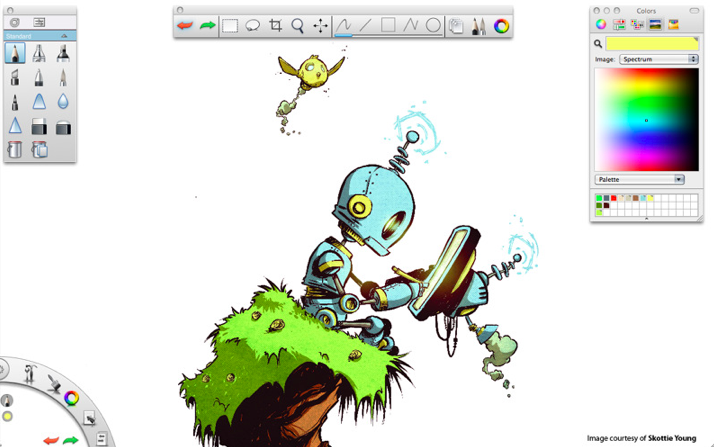 Download link – A free taster of the full Autodesk Sketchbook app, this Express version features all the tools you need for creating beautiful drawings, or a beautiful mess if you’re not so talented. The point is, there’s a good chance whatever you draw is going to look good. Yes, this is no Microsoft Paint – the brushes and tools included are great quality, so whether you want to draw a cartoon character or a scenic landscape, Sketchbook Express is your friend. Although it lacks some of the pro features of Sketchbook, this app is a fun and powerful addition to your Applications folder even in its free form. 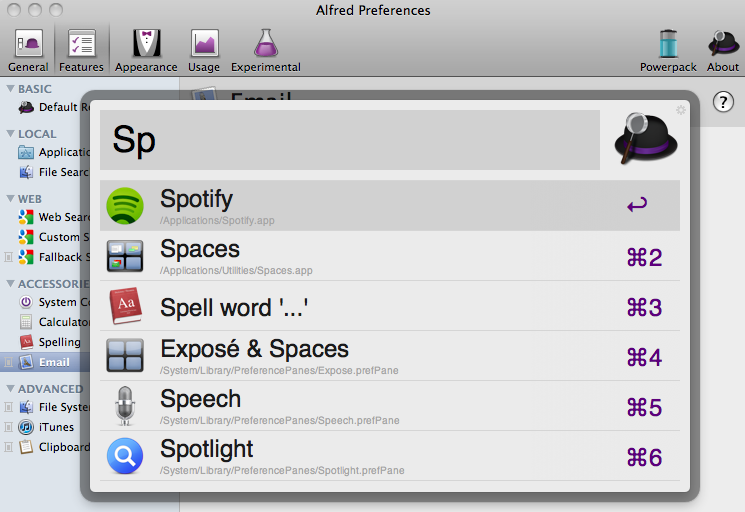 Download link – Like a turbo-charged version of Apple’s own Spotlight feature, Alfred lets you easily search your computer and the Web, get dictionary definitions, perform calculations and carry out system commands like emptying the trash or logging out of your machine with simple text commands that you can learn in minutes. While free, the app can be upgraded with a ‘Power Pack’ for £12 that adds greater integration with apps like iTunes and Apple Mail. If you’re happiest using a keyboard over a mouse, or just want to shave a few seconds off your working day, Alfred certainly fits the bill. Download link – If you want a quick break from your working day, having Pinball HD in your Dock could be just the ticket. 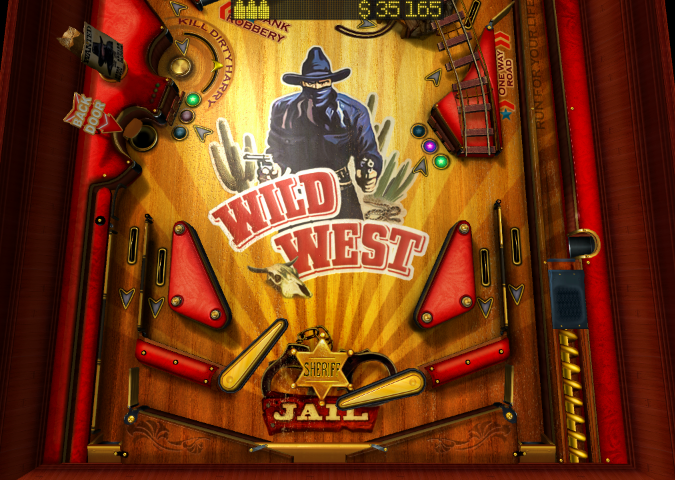 Despite the low price, it’s a fun pinball game with three colourful, good-looking tables to choose from. It won’t grab your attention for hours on end but sometimes that’s exactly what you want. With simple arrow key controls, it’s easy to pick up and play and then safely put down and get back to work once you’ve recharged your batteries. Download link – If you want to organise your thoughts, a mindmap is always a good option. 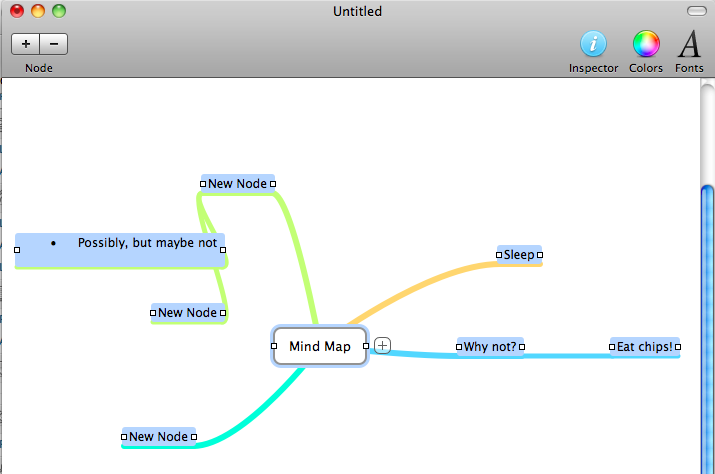 Mindnode makes it about as simple as it can be to organise your ideas into ‘trees’. Simply drag a line, write some text and you’re done. While there are far more powerful alternatives to this out there (including Mindnode Pro, in the App Store for £14.99), as a free utility that’s only a click away, Mindnode is an ideal, lightweight utility that does its job and nothing more, nothing less.